Continuing east on Bank Street, on the corner of Bank and Martha Streets sits a large brick school building. It was on this 2 acre piece of property that the town purchased for $3,000 in June of 1884 that Seymour's first high school would be built. It would be two and one half stories high, constructed of brick with a granite foundation and have a large bell tower that would grace the structure. Total cost to construct this new school would be $40,000.When the school opened in the Fall of 1886, there were 456 scholars in nine spacious rooms. They were not only taught the basic subjects but also learned Natural Philosophy, Electricity, Music and Drawing. This new high school became well known in the state as being one of the best equipped and one of the most efficient for its size. It was a tradition of each of the early graduating classes to engrave the year of their graduation into the granite blocks of the foundation. Today these engravings can still be clearly seen. As the high school population continued to increase the Center School Annex was constructed next to the main school building to handle the extra students. Seymour continued to grow and by 1915 it was deemed that a new, larger and more modern high school should be built. Land was purchased in the Pine Street area (near the Broad Street area) and by 1916 a new high school opened. The Center School and the Annex now became an elementary school complex with grades Kindergarten through eighth. This move allowed a number of the one-room schoolhouses to be closed and condensed into this building. In the summer of 1977 Center School closed its doors as an elementary school for the last time. The town now had three modern and efficient elementary level schools that could handle the student population. 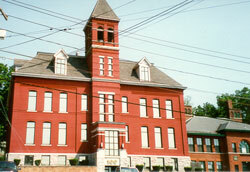 The Seymour Historical Society was given two large classrooms in the Center School building to create a museum to collect, preserve and display Seymour's history in and within a few years the Society placed both Center School and the Annex building on the National Register of Historic Places. However, by the early 1980's the town decided it should sell the Center School. Today, you see the Center School building proudly standing housing private businesses and the Center School Annex building housing the Seymour Board of Education, the Seymour Senior Citizen Center, a nursery school and a teen center.